Dimensions (HxWxD): 0.625" x 0.5" x 0.45"
This 14.47 carat Demantoid Rough Triple Garnet Cluster on Matrix from Antetezambato, Ambanja Antsiranana Province, Madagascar displays an olivine green coloration and the typical rhombohedral crystal structure that distinguishes this extremely attractive and highly prized variety of gemstone garnets. This little cluster of garnets has great movement & twists around into a small amount of druzy matrix; it's form consistent with the demantoid garnet's known tendency to occur in a matrix that is calcium-rich, often also with albite, magnetite and biotite. The garnet family contains a variety of gemstone members, all significantly harder than quartz crystal, which generally form either dodecahedral or rhombohedral crystal formations. Garnets of all colors, ranging from emerald green to bright orange, and on into shades of deep, deep infrared have been highly prized by collectors for centuries, are often associated with royalty. The garnet family of stones have somehow generated an aura of sensuous opulence which this stone exemplifies for many collectors. Demantoid garnets are calcium and iron-bearing gemstones, an unusual pale green variety of andradite garnet and typically grow in metamorphic rock formations. 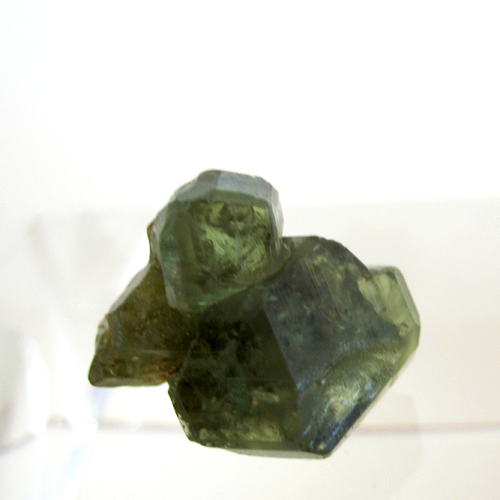 The demantoid variety of garnet is a relative newcomer to the garnet family. This particular variety of garnet gemstone was discovered in 1850 in Russia. Darker demantoid garnets are often more highly valued, but the more pale specimens often exhibit more fire and thus may be attractive to those seeking more luminous, energy-filled garnets. The degree of "fire" within a gemstone is related to its ability to disperse light, and some extremely valuable demantoid garnets can display a higher dispersion than diamonds. 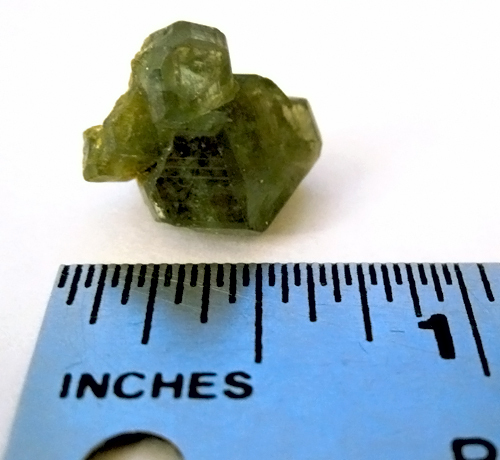 Demantoid garnet gemstones tend to be quite small as you can see looking at the size of the demantoid garnet pictured here. You should be aware that cut and polished demantoid garnet gemstones tend to be quite small, averaging 1 carat to 2 carats and anything over 5 carats considered totally museum quality. Garnets have been used for millennia in shamanistic healing and spiritual traditions across the globe, by Native American Indians, Aztecs, Mayans, and African medicine men and healers. Garnet is also one of the stones found in the breastplate of the Israeli High Priest in the Old Testament. Garnets typically are used by spiritual healers to transmute negative energy or stuck energy within a sick person into healthy energy, and to restore the proper flow of life force energy throughout the individual's body. The coloring of garnets appears in a vast range from whitish to green, orange & crimson, with a multitude of grades and hues available. 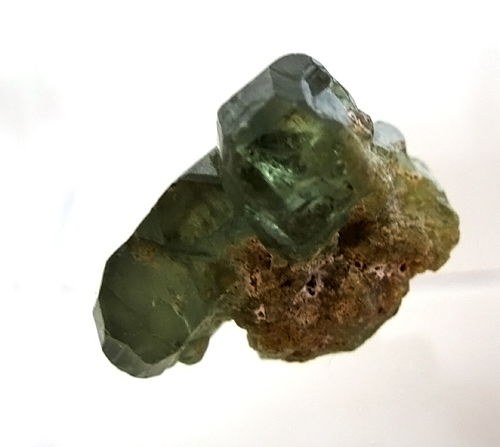 Green garnets are usually associated with the heart chakra, which is often depicted as green in color, according to the Western chakra system. Thus green garnets are thought to energize the heart, help open the heart, and resonate with all spiritual practices involving compassion and service. Green garnets are also traditionally used to attract abundance in life, as the color green is traditionally associated with fertility. Green garnets also impart an enhanced energetic connection with nature and nature spirits as most green stones tend to do for the bearer. ?Green garnets are associated with true love, a union based upon the workings of the heart rather than lower chakra activities. Garnets work to equilibrate, cleanse and energize the root chakra and the second chakra, grounding the bearer, strengthening the bearer's self-confidence and sense of physical security, enhancing the sexual energy, the flow of kundalini, and the store of universal life force energy in the physical body. This Demantoid garnet is very unusual in that it works not only with the heart chakra & hara center or root & 2nd chakras, but seems to help the bearer access a chthonic connection with our Mother Earth, deep within the deepest parts of ourselves. This was the experience that we (Jane Sherry & Curtis Lang, Satya Center founders) had in working with Demantoid Garnets. Note: weight above is shipping weight. Net Weight is 14.47 carats or 2.894 gms.